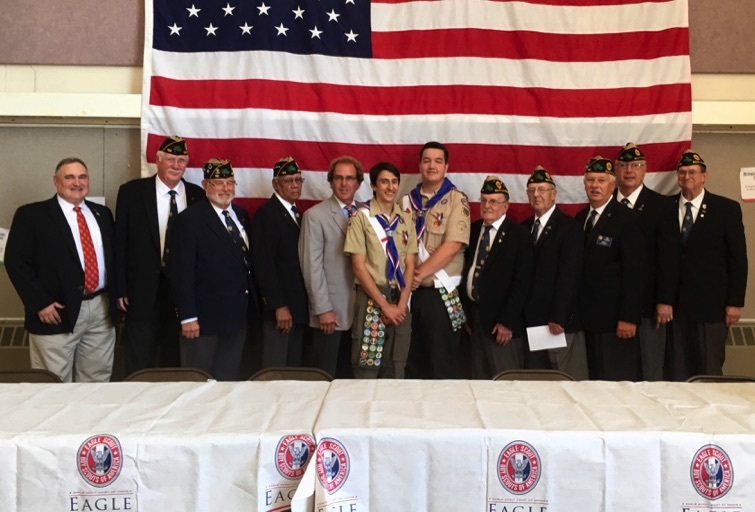 Troop 880 Eagle Scouts Eric Hofmann & Gregory Morneaulte — Court of Honor on 8/13/17. Sandy, Ron, Art, Pete, Ken. and 11 Post 133 was there to honor his achivement. As Gold Award recipients, these three young ladies join an elite group of women. 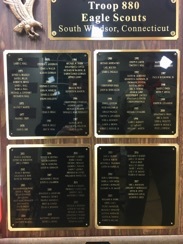 The Girl Scout Gold Award is the highest achievement in Girl Scouting. Only the best and brightest attain this ~ the highest award in Girl Scouting. 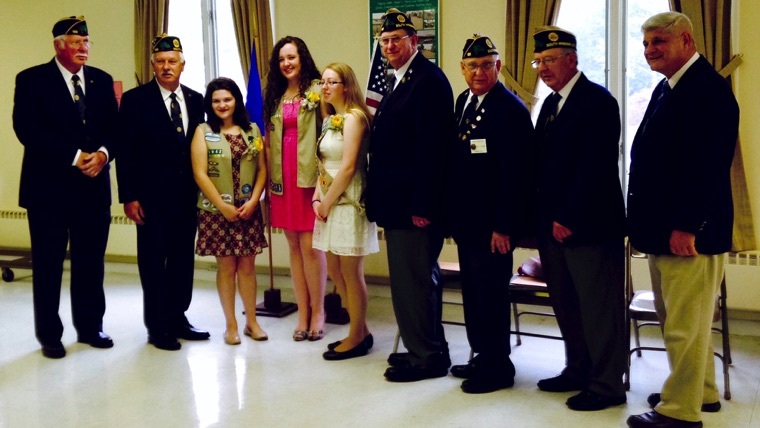 The recipients from L to R: Emily Rizza, Erin Heneghan and Jennifer Newton. Post 133 members L to R: Skip, Art, Ken, Roger, Ron and Bill. 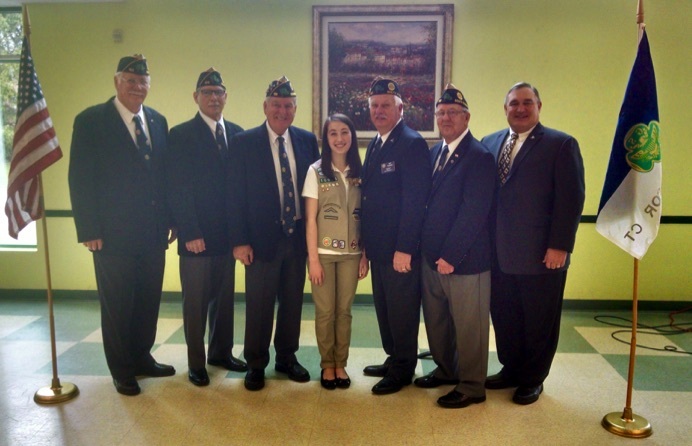 in achiving the highest honor in Girl Scouts. 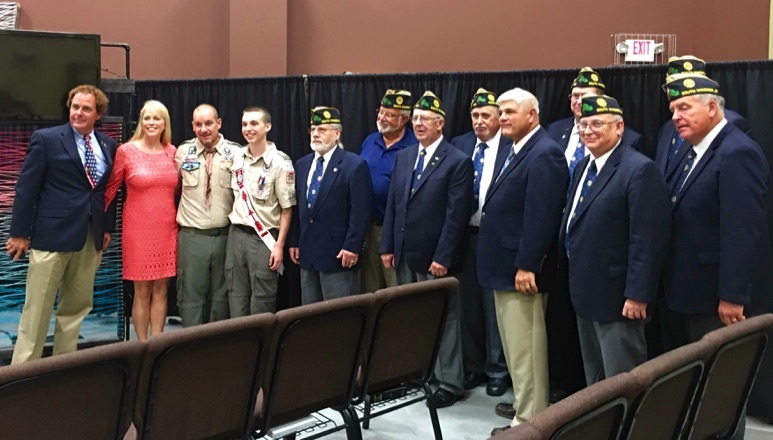 A troop 880 Eagle Scout Court of Honor was held on 6/26/2016. 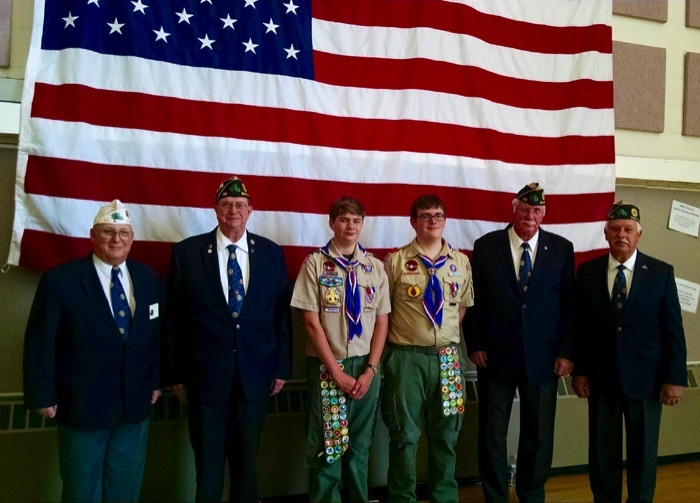 A troop 390 Eagle Scout Court of Honor was held on 8/22/2016. 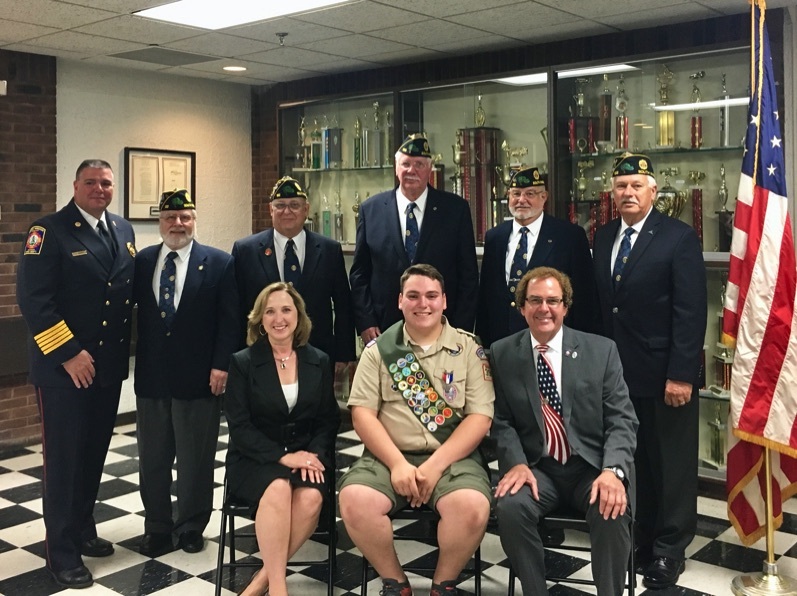 A Troop 186 Eagle Scout Court of Honor was held on 8/24/2016. 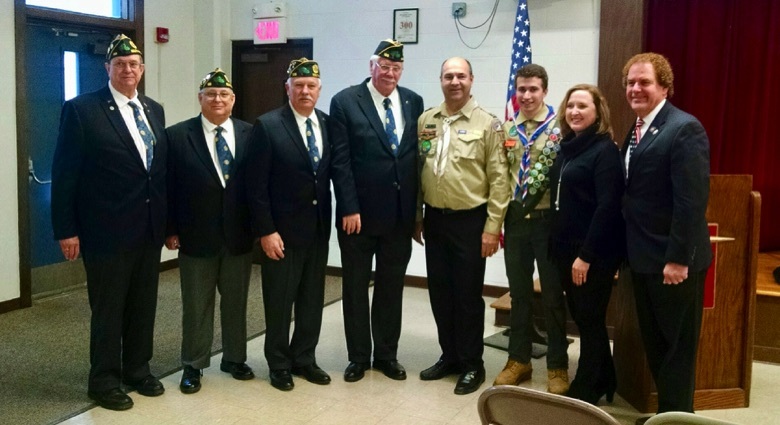 Troop 186 Eagle Scout Court of Honor on 12/27/16. 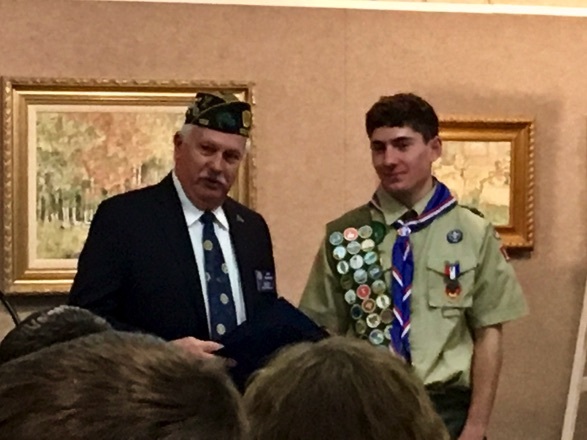 Troop 186 Eagle Scout Ben Liebman Court of Honor on 1/7/17. L-R: Ken, Roger, Art, Skip, Assist. 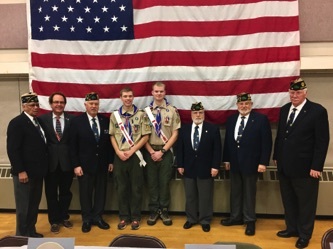 Scout Leader & Knights of Columbus Grand Knight Steve Leslie, Eagle Scout Ben Liebman, Mayor Carolyn Mirek, State Rep. Tom Denicki. Sunday, March 26th, 2017 at the South Windsor Library. Sunday, June 4th, 2017 at the South Windsor Fire Department Engine Co. 1. 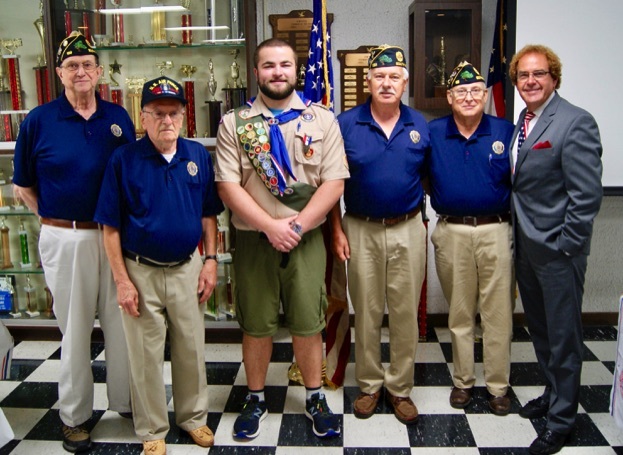 Troop 390 Eagle Scout Brendan William Elliott — Court of Honor on 7/29/17. Ken, Mayor Carolyn Mirek, Pete,Roger, Ron. 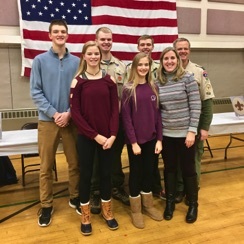 Troop 880 Eagle Scouts Jackson & Sean Reed — Court of Honor on 1/5/18. 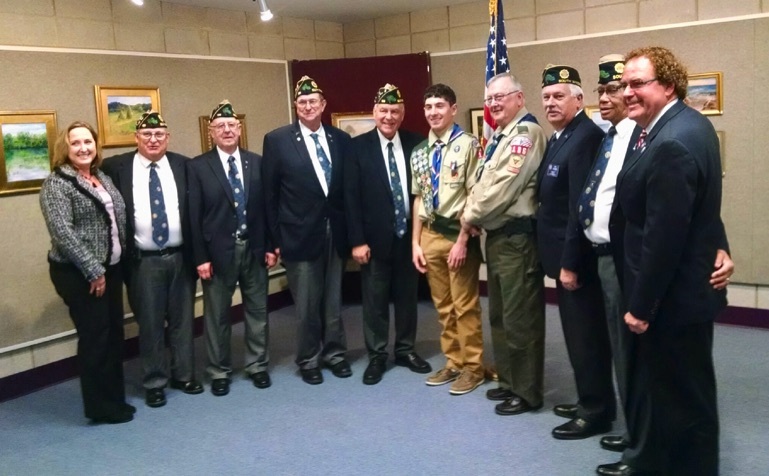 30 of Troop 880's Eagle Scouts attended the swearing in of its two newest members. 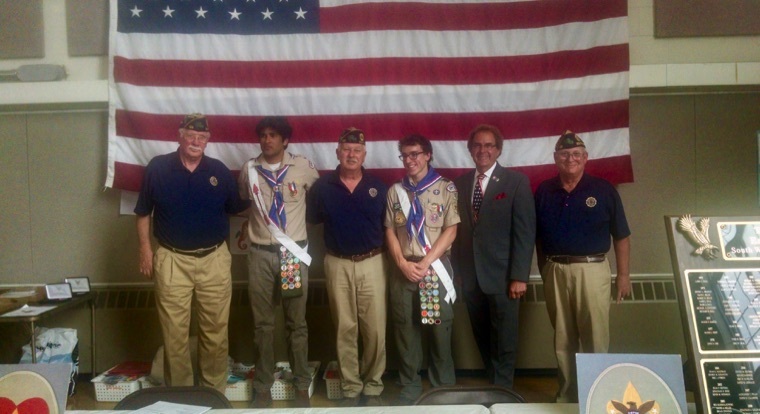 L to R: Skip, Abhi Goyal, Art, Elliot Bushman, State Rep. Tom Denicki and Roger. Abhimanyu’s Eagle Project was building a garden for the students at P R Smith Elementary School to promote the school’s healthy eating curriculum. 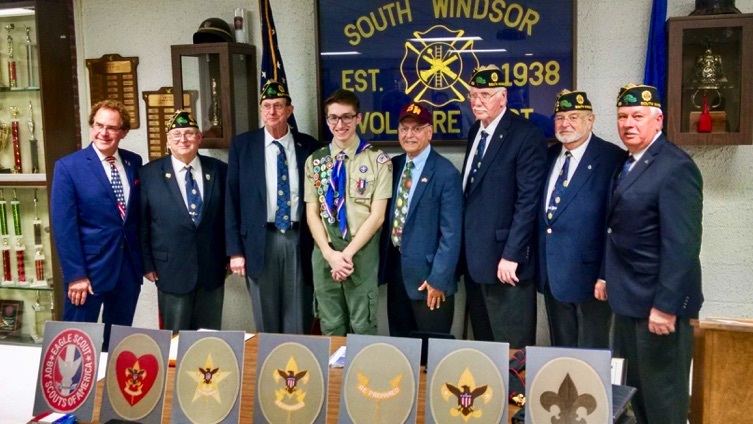 Elliot’s Eagle Project was to design, plan and led his team of scouts in building a large “U” shaped park bench for the East Windsor Dog Park." 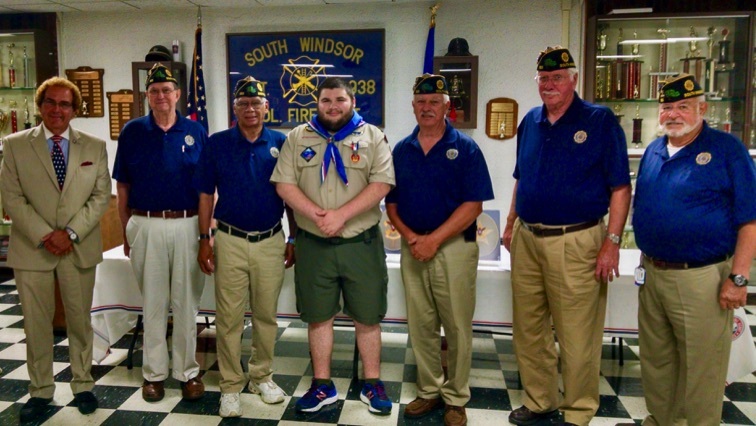 Eagle Scout Alexander Cox of South Windsor, the son of Lawrence and Kim Cox. L to R: Ken, Sandy, Alex, Art, Roger and State Rep. Tom Denicki. Alex’s Eagle Scout project was at the Little League fields on Nevers Road. Alex led a team of volunteers that built two new practice pitching mounds and installed storage shelves in one of the buildings. 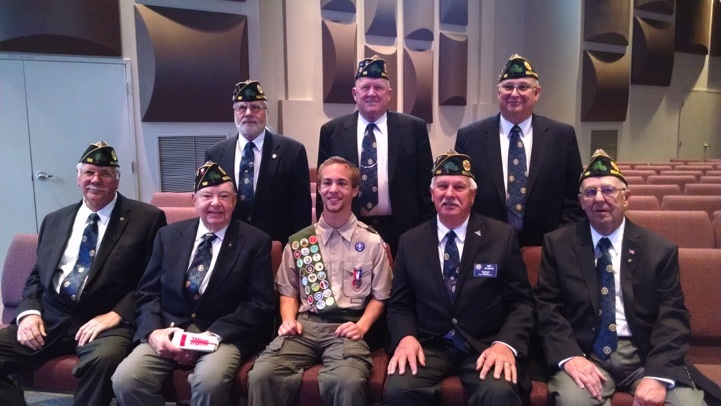 On Sunday June 24th, Troop 880 held an Eagle Court of Honor on August 5th for Kevin Otto. L to R: State Rep. Tom Denicki, Ken, Lee, Kevin Otto, Art, Skip, and Sid. and consisted of painting house numbers on curbs in front of 560 homes in South Windsor. 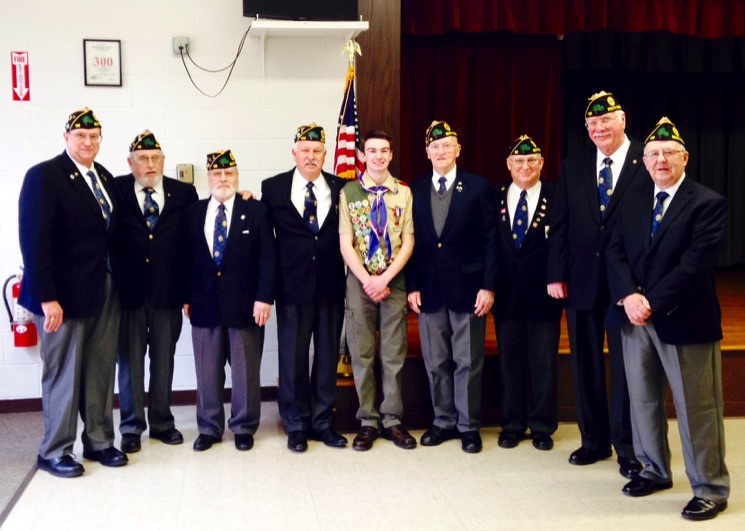 On Sunday December 16th, Troop 62 held an Eagle Court of Honor for Nicholas Pallandino. Councilor Andy Paterna, Skip, Sid and Art. 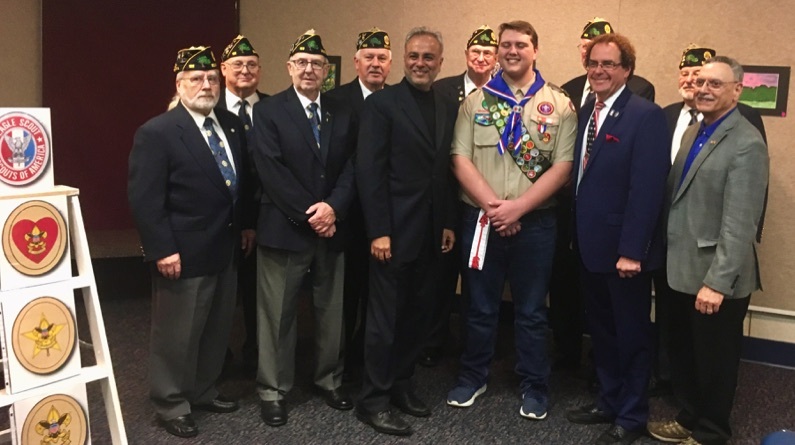 On Sunday Janurary 6, 2019 Troop 186 held an Eagle Court of Honor for Stephen Rosenbaum. Rear L to R: Roger, Art, Ken, Skip F., and Sid. State Rep. Tom Denicki, and Councilor Andy Paterna. 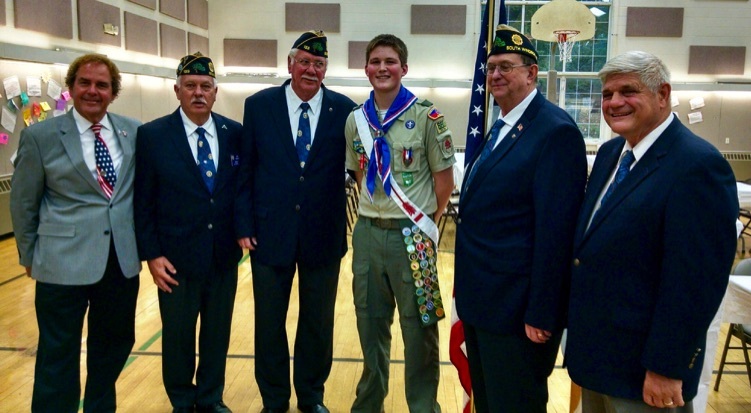 conducted its 96th Eagle Court of Honor for Eagle Scout Benjamin Placzek. 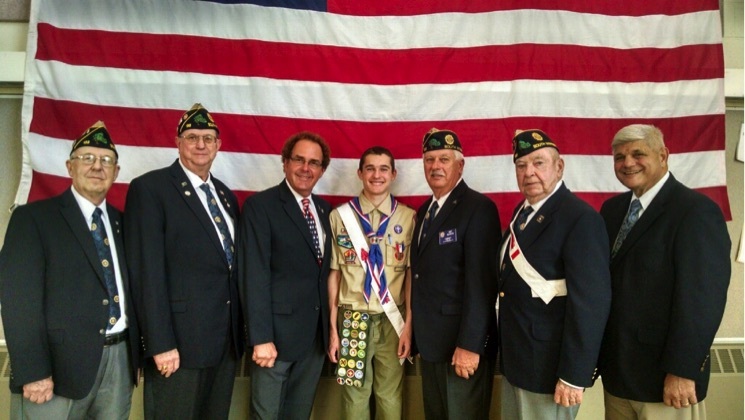 L to R: Sid, Bill, Art, Eagle Scout Benjamin Placzek, Ken, Lee., Roger and State Rep. Tom Denicki. 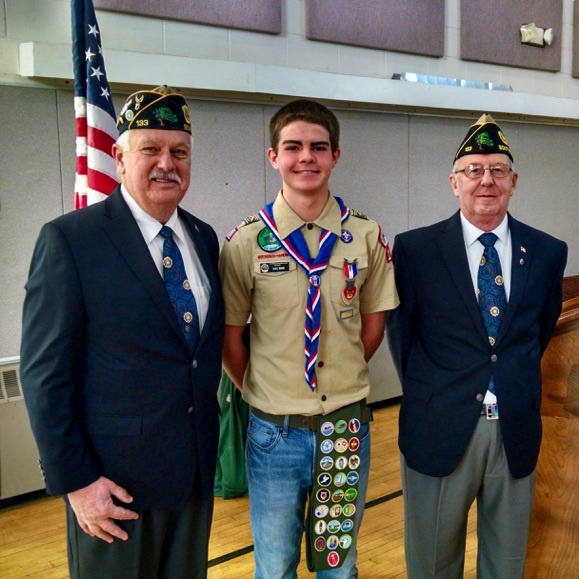 conducted its 97th Eagle Court of Honor for Eagle Scout Matthew G. Pelletier. Deputy Mayor Andy Paterna, Sid, Sandy and Art. 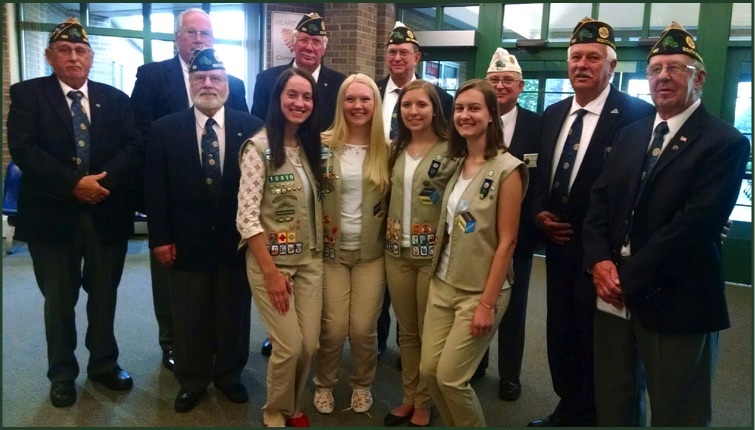 Troop 880 has 146 scouts who have attained the rank of EAGLE since forming the troop in 1968.